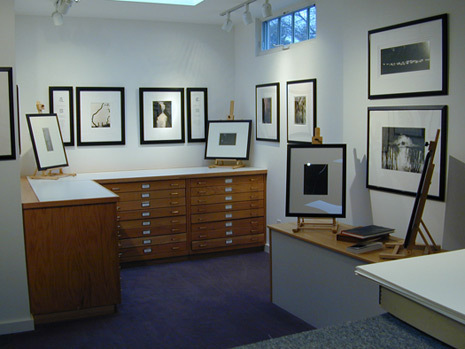 Scheinbaum & Russek LTD have approached the gallery world through their roles as educators, artists, and collectors and bring to their gallery an appreciation of photographers, the fine print and the history of photography. Scheinbaum & Russek LTD was established in 1980 through a series of serendipitous events. In 1978 David Scheinbaum moved to Santa Fe, New Mexico with the hope of meeting and working with the pre-eminent photography scholar, Beaumont Newhall. This dream came true. Their professional relationship had many facets and with that a friendship quickly developed. In 1979 David began printing for Beaumont Newhall. The many people who came to work and study with Beaumont often asked to see his photographs – thus David found himself in the position of creating a “meeting place” for photographers and collectors. The idea for a gallery evolved and in 1980 when Janet Russek moved to Santa Fe they opened their doors with a retrospective of Willard Van Dyke’s work. While David continued to work with Beaumont Newhall, Russek began assisting Eliot Porter. Their relationship also grew from the studio to the gallery and the gallery began to expand representing both local and international photographers. To date they have exhibited and worked with over 300 photographers. Scheinbaum & Russek have approached the gallery world through their roles as educators, artists, and collectors and bring to their gallery an appreciation of photographers, the fine print and the history of photography. Scheinbaum & Russek LTD are the exclusive representatives for the Beaumont and Nancy Newhall Estate and for the Eliot Porter Estate.